As a reviewer and Holmes enthusiast, I’ve read a vast number of Sherlock Holmes novels meant for adults, and I’ve encountered quite a few meant for children. The Young Sherlock Holmes Series by Andrew Lane, of which I have several volumes, is somewhat unusual because it fits into the middle, with a preteen to teenaged target audience similar to Eoin Colfer’s Artemis Fowl Series. Through the stories, Lane provides a rich sensory experience, introducing the young reader to period-accurate details of life in the late 1800s. I was particularly struck by the visceral description of life in a boys’ boarding school. As the action intensifies, the reader is carried along by this attention to detail, through mysteries that will stretch the imagination and give the reader a chance to unravel the truth along with Sherlock Holmes–mysteries that are just gruesome enough, but not too much for the older preteen or teenaged reader. Speaking of Holmes, his character is well fleshed out and develops in a believable way toward the dichotomies of reason and emotion in his personality. As with any book that explores the detective in his early life, certain decisions have to be made about what, exactly, made him who he is–an issue that most who write about the adult Holmes can either skirt or avoid altogether. Lane’s decisions have structural integrity within the story and build toward the character we know and love. Additionally, the richly-drawn world of Young Sherlock Holmes is complemented by complex original characters and believable appearances by familiar ones. Some of the events depicted in the series are likely to be too intense for the youngest readers, but preteens, teens, and adults who enjoy reading about the early life of Sherlock Holmes will enjoy detailed stories and the beginning of the career of a remarkable character. Recommended for the young and young at heart, this series is still being written, and more volumes are expected. The above-reviewed work was provided for consideration by the publisher. Opinions expressed are the reviewer’s own. 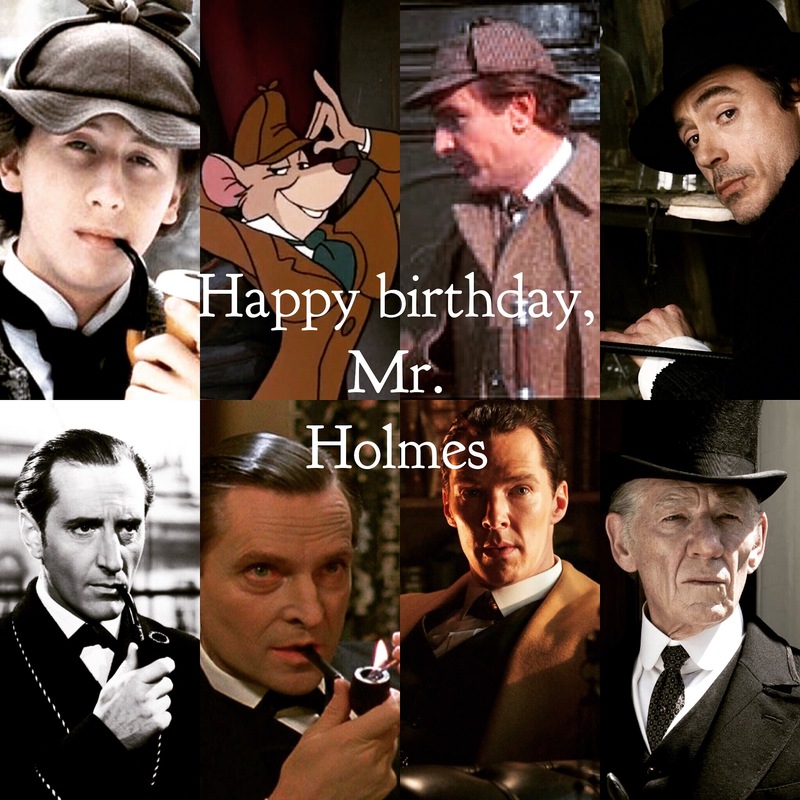 Happy 162nd birthday to the world’s first consulting detective! The poem 221B by Vincent Starrett is treasured among Sherlockians for its final line, which reminds young and old that “it is always 1895,” but Sherlock’s first holiday special turns my mind to the lines above even more. The Abominable Bride is not really an episode about plot, though it has a good one, and it’s not about advancing the overall arc of the series very much. 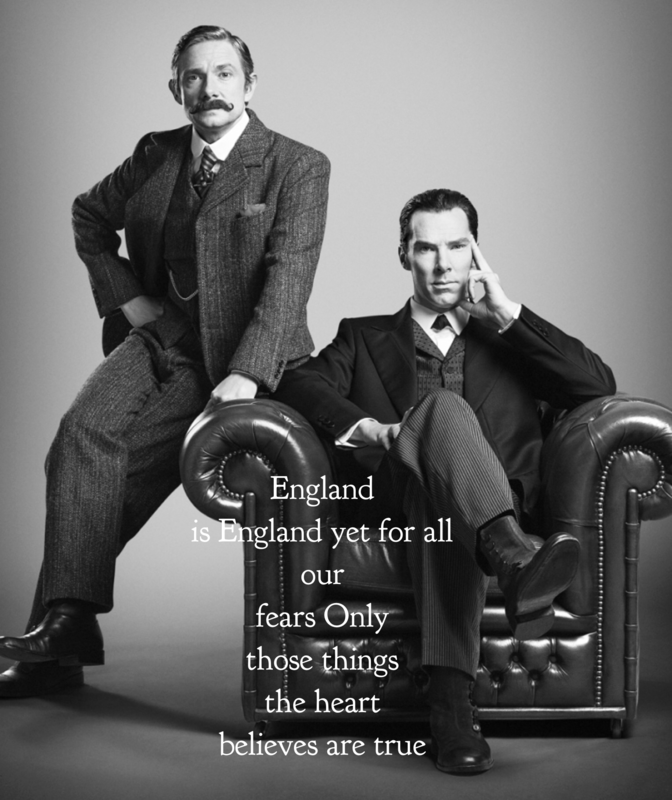 Instead, it’s about the things the heart believes are true, specifically the heart of Sherlock Holmes. Mycroft Holmes once asked, long ago, in A Scandal in Belgravia, “What might we deduce about his heart?” This episode answers that question. In the early days of publicity, we were told that the story would be a complete one-off, fully Victorian and unrelated to the series arc as a whole. In recent days, a low-key change occurred, in which cast and showrunners began teasing a series connection after all. The episode began with a confirmation of this in the form of a montage showing the viewer a quick timeline of everything that has happened in the series so far, surely a strange choice if the episode wasn’t going to connect to it. Immediately after, however, we were thrown into an immersive Victorian world, complete with a Doyle-heavy origin story and new-old versions of our favorite characters (with the exception of Vinette Robinson’s Sally, whom I was sad to miss). The case is brought by a mutton-chop-sporting Lestrade, who introduces Holmes and Watson to the Abominable Bride herself (played by the phenomenal Natasha O’Keeffe), a wedding anniversary murderess-suicide who somehow appears to have risen from the dead to kill her husband—and happens to have killed herself in the exact same way we saw Moriarty kill himself earlier in the series. What follows is a fairly straightforward investigation that echoes both the style the BBC Series has established and Doylean canon tropes. Two reveals were particularly enjoyable—Mark Gatiss’s Mycroft, bearing the girth and sloth of Doyle’s version, and morgue director Molly in male disguise. At the same time as the case progresses, however, there’s an intrusive subplot that keeps weaving its way through—the female voice in the Victorian Era, with a frustrated Mrs. Hudson going on a silence strike, an angry Mary Watson taking employment without her husband’s knowledge, and a particularly outspoken maid. Hovering above all this is a cryptic tease by Mycroft about an unseen army that needs to win. It all seems pretty straightforward until it doesn’t. Suddenly, the modern photo of Irene Adler surfaces, and characters begin speaking in increasingly anachronistic terms. The action sequence with the Bride seems like it should be climactic, but it really isn’t, and it’s not meant to be. A Victorian Mind Palace sequence culminates in a visit from Andrew Scott’s Moriarty at his creepy best, and the truth starts to emerge: The case isn’t about the case at all, and furthermore, it’s not even real—the whole thing is a drug-induced delve into Sherlock’s Mind Palace, an attempt to use an unsolved mystery to solve an all-too-modern one. Knowing this Shyamalan-level twist changes the entire framing of the episode as a whole. No longer are we seeing a surprisingly clever Victorian John; we’re seeing the idea of Watson who lives in Sherlock’s brain. The same is true for each character, and, in turn, they reveal different aspects of Sherlock’s psychology. The episode’s pre-climax takes place when Holmes unveils the Victorian feminist society that produced the Bride. I’ve seen various confusion and criticism about this, but it’s not a real thing, and it’s not meant to be seen that way. Again, it’s a part of Sherlock’s mind, the working-out of guilt over the women he’s wronged, a gallery led by Molly and including Janine, with whom he engaged in a fake romance. The scene has strong similarities to Sherlock’s courtroom Mind Palace from earlier in the series. The true climax occurs when the Bride unveils herself and turns out to be Moriarty. As a modern-time, but still dreaming, Sherlock frantically digs up the real-life Bride’s grave to find two corpses (a reference to Lady Frances Carfax), he’s plunged into the canonical version of Reichenbach, a showdown with Moriarty on the edge of the falls. Except, this time, it doesn’t end the same way. In an echo of long-ago episode A Study in Pink, Watson appears at exactly the right moment and kills Moriarty himself. This is entirely symbolic, Sherlock’s mind finally exorcising the ever-present Moriarty, who has come to represent his weaknesses, by realizing that he will never have to confront his failings alone because he has John by his side. The end of the episode doesn’t tell us much beyond the fact that Holmes understands the next phase in the (truly dead) Moriarty’s plan and that he’s still using a drugs on occasion, a fact that deeply concerns his brother Mycroft, whose combination of care and anger throughout the episode was played beautifully by Mark Gatiss. We’re left on a cliffhanger, not in a very different place from where we began, but also worlds away from where we began. Much as The Sign of Three explored the relationship between Holmes and Watson, The Abominable Bride explores Sherlock’s relationship to himself—his fear that he’s far less clever than he’d like to be, his ambivalence about his lack of conformity, and his deep-seated terror of weakness. Ultimately, the series stays absolutely faithful to its own heartbeat, allowing its protagonist to finally, and fully, realize that his hope lies in human connection and in the friendship of his Boswell. The Abominable Bride is the fulfillment of The Reichenbach Fall. The man who fell alone can now fly because he’s not alone any more. In the context of the series, the Victorian Holmes and Watson of The Abominable Bride never lived, but Starrett said it best: They still dwell together, seated by their Baker Street fire, where Sherlock’s heart, and mine, believe they will live forever.